Surprise your business relationship with an indoor skydive. Do you want to surprise your business relations with original promotional gifts? Then give the unique indoor skydive experience as a gift! Let your business relationship experience the ultimate feeling of freedom at Indoor Skydive Roosendaal. An indoor skydive is a special gift to give and also to get. On this page, you will see the various possibilities about our promotional gifts. Finding an original gift can be a proper task. The gift must be unique, special and surprising. We’re happy to have some great gift ideas for you! We have various options when it comes to a gift for him or a gift for her. To give an indoor skydive gift is always a very good idea! It’s a amazing experience that will be discussed for years to come. We are sure that an original promotional gift or unique gift, such as an indoor skydive, makes collaboration even more valuable. 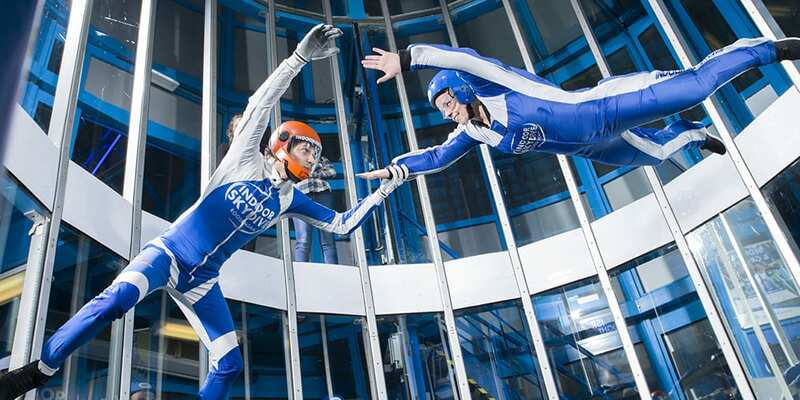 For example, combine the indoor skydiving with a creative meeting. Or surprise your business relationship with a brainstorm session in our creative space. Because then, the original and creative ideas come on mind by itself! You can also join us for team building or for corporate events. Our team will be happy to help you organize a fully-organized day! Check out all our business options. Incidentally, we know as no other that any relationship fits another attention! That’s why we also offer original customized gift ideas. Even for larger numbers we can offer a suitable proposal (minimum decrease 10 vouchers). That’s how you really surprise your relationship with a unique gift! It is also possible to order online tickets, so you have your promotional gift at home real quick! So, if you want to know more about all our opportunities for promotional gifts. Fill in the form below and we will contact you as soon as possible! Request a customized offer without obligation (minimum decrease is 10 vouchers). Buy at less than 10 vouchers online tickets through our shop. Complete the form below with all wishes and receive a response within 5 (working) days.